From Native Americans to the hippies and beyond, join this 2-hour Greenwich Village history tour led by a native New Yorker. In a small group, your guide will walk you through the Greenwich Village streets of early 19th-century town houses. Stories of past residents, local history, Native American history, architecture and personal anecdotes enliven this New York City tour. Meet your local guide for this small-group 2-hour tour from 8th avenue and 14th Street to Washington Square Park. 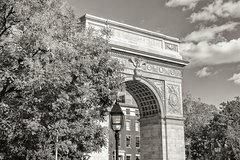 The tour covers 400 years of the history of the people, cultures, and arts of Greenwich Village in New York City. Discover where the 'castle' of great Native American Sachems and the scandals of the founding fathers of the Republic is. Learn about the hangouts of artists, writers, and gangsters that lived in Greenwich Village as we wend your way slowly through the winding village streets. You may ask your guide to customize the tour based on your interests. There are short rest breaks during the tour as needed.